Ever since the Roots Crew became the house band for Late Night With Jimmy Fallon in 2007, they have been everywhere. Since 2007 they have released four studio albums: How I Got Over, Wake Up! (With John Legend), Betty Wright: The Movie (With Betty Wright) and Undun. Furthermore, Questlove gigs as a DJ every chance he gets, writes biographies and made Twitter cool. Black Thought backs up hip-hop royalty on Fallon, slays bars on tracks such as “Bird’s Eye View” and is very involved with his community Foundation called GrassROOTS. On top of all of this, the Legendary Roots Crew has seen their annual two-day festival called “The Roots Picnic” grow, have given back to the Philadelphia community and hosted huge, nationally televised Fourth of July jam concerts. They are everywhere, splitting time between NYC, Philly, going on tour and putting out amazing music. In fact, this fall they are set to release another collaborative effort, this time with Elvis Costello, and have another full length album on the way. This past April, their album Things Fall Apart officially reached platinum status. Released in 1999, Things Fall Apart is at times raw, yet polished. Considering how the Root’s career has changed over time, their classic record still has much to offer and sheds a great deal of light on how the group has managed to keep their creative integrity. Recorded at the height of the Soulquarians era and featuring a slew of artists, Things Fall Apart has so much to offer by way of lyricism and musicality. There are tracks such as “You Got Me” with Erykah Badu and Eve that beautifully describe the love and the trust needed for a functional relationship. On “Step Into The Realm,” “Adrenaline” and “and “Without A Doubt” Malik B., Dice Raw and Black Thought drop unforgettable lines. Meanwhile, Common and Yasiin Bey (f.k.a. Mos Def) drop by to contribute two of the more memorable tracks, “Act Too…Love Of My Life” and “Double Trouble.” There is even space made for Ursula Rucker to read her hauntingly picturesque poetry on “The Return To Innocence Lost”, describing abuse and grief in the way only poetry can. From a production standpoint Questlove’s drums are on point, always providing the perfect balance of kick and snare. The keyboards and guitar sounds are blended perfectly with the heavy hip-hop boom bap with help from James Poyser and D’angelo. There is assistance from the likes of Scott Storch and J Dilla on the production side. However, let’s not forget that we are talking about the Roots and live instrumentation was used. 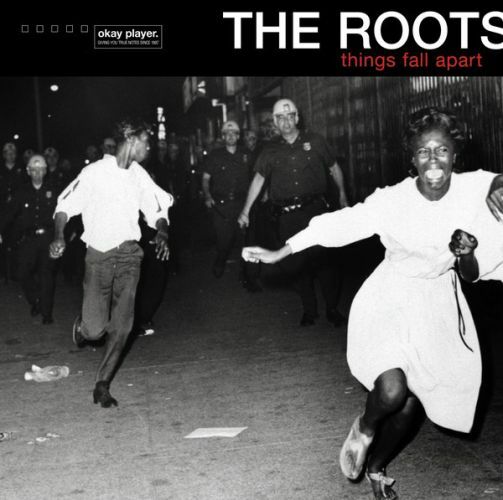 In the end, Things Fall Apart is considered a hip-hop classic and arguably the best album by the Legendary Roots Crew. In my opinion, this is absolutely true but there is more to this record. Things Fall Apart serves as an example of the commitment to quality ingrained within the Roots psyche. They may be moving at a thousand miles an hour but they are still willing to take the time to ensure that what is associated with the Roots is worth a listen, watch or read. Things Fall Apart is a testament to this mind-set.